Author: John Wallace - Director of Innovation, Retail Solutions - Emerson Commercial and Residential Solutions. Proper refrigerant leak detection is essential for retailers, potentially saving them thousands of dollars annually and helping to meet regulatory requirements. Refrigerant leaks can cause both economic and environmental disruptions for retailers. Today, the average supermarket has two to four refrigeration racks charged with approximately 3,500 pounds of refrigerant. According to the Environmental Protection Agency’s (EPA) GreenChill research, about 25 percent (875 pounds) of that refrigerant is lost each year due to leaks. At $7 per pound, this loss equates to an annual expense of about $6,100 — more than $600,000 annually over a chain of 100 stores. And that’s just the financial aspect. In the same 100-store example, nearly 70,000 pounds of refrigerant are leaked into the atmosphere. Introduced in the 1990s to address emissions of ozone-depleting substances such as chlorofluorocarbon (CFC) and hydrochlorofluorocarbon (HCFC) refrigerants used in stationary refrigeration and air conditioning units, Section 608 of the Clean Air Act was revised in 2016 to include hydrofluorocarbon (HFC) refrigerants. This revision also introduced more stringent requirements for repairing leaks in larger appliances as well as new record keeping, reporting and disposal mandates. Per the 2016 revision to Section 608, the next iteration of these requirements will take effect on January 1, 2019, and include the following changes: Lower leak thresholds. The new thresholds are 30 percent (from 35 percent) for industrial process refrigeration (IPR), 20 percent (from 35 percent) for commercial refrigeration equipment (CRE), and 10 percent (from 15 percent) for comfort-cooling equipment. Required inspection and monitoring. Section 608 now requires quarterly/annual leak inspections or the use of automatic, continuous monitoring devices for refrigeration and air conditioning equipment that have exceeded the threshold leak rate. New reporting requirements.Owners and operators must maintain hard or electronic copies of reports documenting the full charges of appliances and the types of automatic leak detection systems used. For chronically leaking appliances, owners/operators must also submit reports if their systems contain 50 or more pounds of refrigerant and leak 125 percent or more of their full charge in one calendar year. 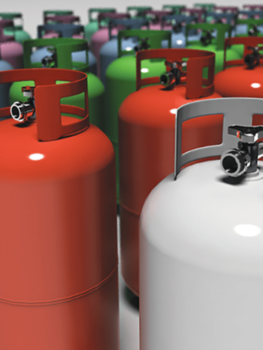 Disposal requirements.Technicians must keep a record of refrigerant recovered during system disposal from systems with charge sizes ranging from 5 to 50 pounds. With all of these revisions on the horizon, it’s important to note that the EPA takes enforcement very seriously. The consequence of noncompliance can be significant: the agency is authorized to assess fines of $37,500 per day for violations. We recommend that companies implement effective refrigerant leak detection programs to minimize refrigerant leaks and plan a response strategy in the event of a leak. Direct leak detection technology includes fixed or portable monitors installed on-site, which detect the concentration of refrigerants in the air. These can be set close to the anticipated leak airstream, in enclosed spaces and in areas near the floor where leaked refrigerants collect. The renewed regulatory focus on reducing refrigerant leaks has caused retailers to put more emphasis on developing efficient and effective leak detection strategies. Leak detection programs not only allow retailers to stay on top of regulations; they can potentially save costs associated with lost refrigerant, the degradation of refrigerated system performance and food loss.